Do you have a difficult time choosing lenses and frames? Do your current lenses only allow clear vision when you are looking straight ahead? Do you question what lens coatings you need? Worry no more! Now that Kiyan Optometric is using the latest technology from Essilor, called the Visioffice® with Eyecode technology), we can help you make the best choice - easily! The Visioffice® System is Essilor's all-encompassing measuring system that allows our opticians to obtain every possible parameter required for modern lenses - with extreme accuracy. 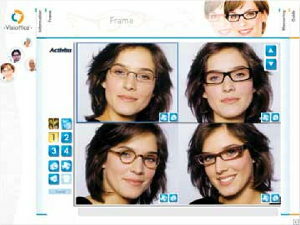 Visioffice® also encompasses a unique measurement called eyecode that allows you to go one step further in terms of lens personalization by measuring the Eye Rotation Centre (ERC). Eyecode is a stunning breakthrough. Using the new patented Visioffice® technology, eyecode enables our opticians to determine the individual position of each eye's rotation centre with one quick and easy measurement. This eye data can then be combined with frame and head/eye behaviour data to create truly personalized single vision and Varilux® lenses. Eyecode is unique to Visioffice® and the combination of technologies outperforms all other measuring systems on the market. By enabling precise measurements including dynamic 3D eye measurement this pioneering new technology enables our opticians - for the first time ever - to pinpoint the exact Eye Rotation Centre (ERC). With this vital new measurement - the eyecode - patients benefit from something they've never had before: truly bespoke accuracy and ultimate lens personalization.